I am not a fan of vegetarian food. I mean I like to eat vegetables, but I don't like to eat vegetables that pretend to be meat. Do you get what I am trying to say? Well, last night, I went to a "lou sang" dinner with my family at Kuan Yin Vegetarian Restaurant located at Section 17, Petaling Jaya. Now although it is a vegetarian restaurant, I was looking forward to my dinner as I have been there several times and their food were really quite good! While waiting for our food to arrive, we were given three different appetizers. 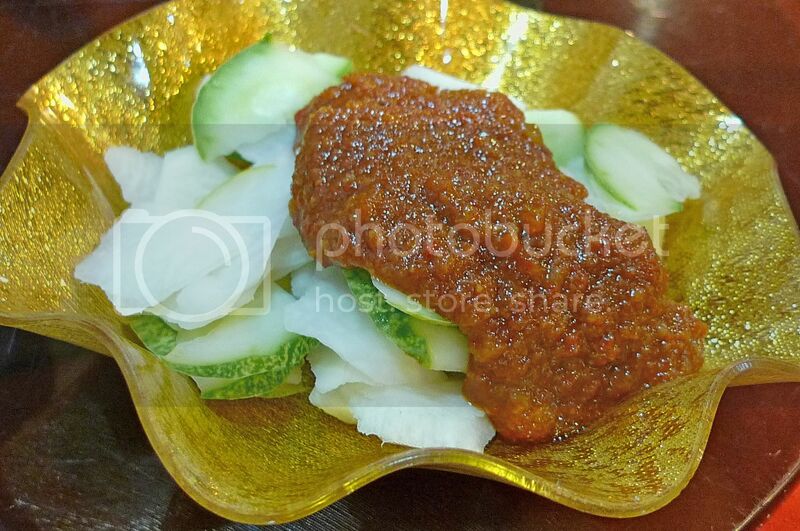 I loved the chips and the Chinese rojak, but didn't quite like the barbequed bean curds. Give me real pork meat any time! Haha! We started dinner with the yee sang. 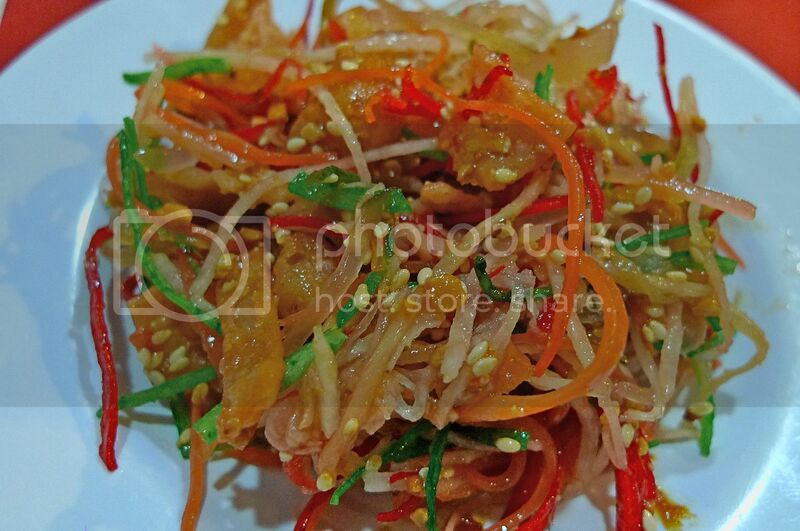 It is a normal practice to start any Chinese New Year dinner with yee sang. 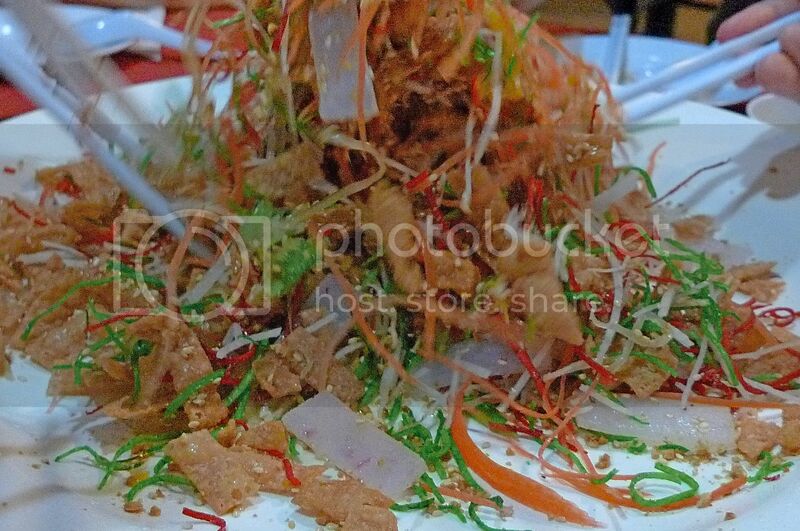 Of course before eating it, everyone must toss the yee sang and mix up all the ingredients on the plate. The higher you toss, the more prosperous you will become! Now this is my plate of yee sang. It was yummylicious!! As I have mentioned earlier, I do not like ordering "meat" dishes at a vegetarian restaurant. I prefer to eat real meat. 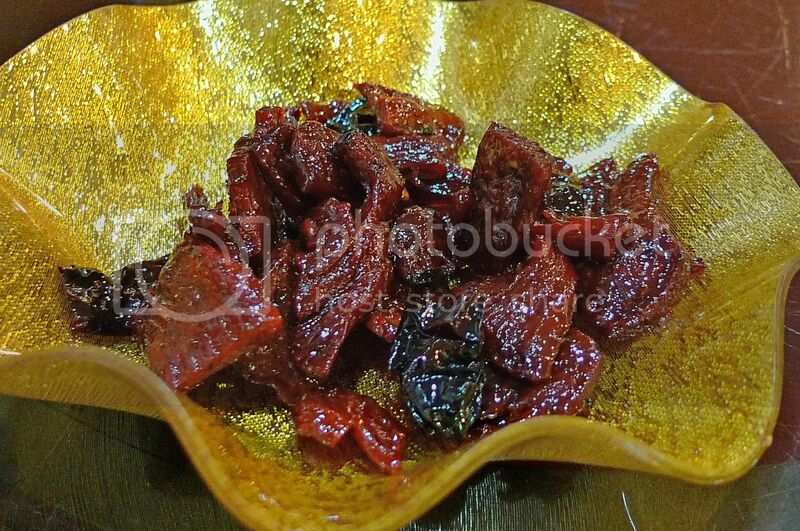 But the sweet and sour fragrant meat (ku lou yuk) at this restaurant was delicious! If you do not know what to order at this restaurant, this dish is a safe bet. Altogether we ordered 5 dishes (excluding the yee sang). All the dishes came out at the same time, which was good. We had a bowl of brown rice each. 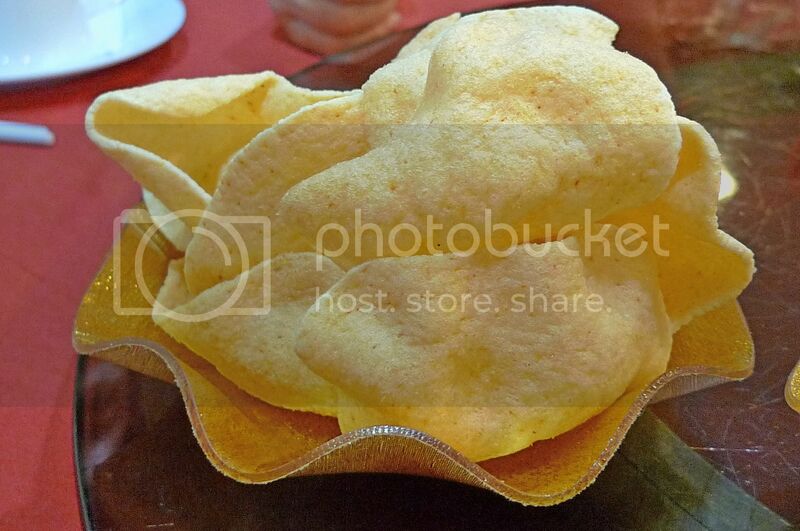 One of the other dishes was the yam basket (fatt put). This is my brother's favourite and he would order this every time he eats here. 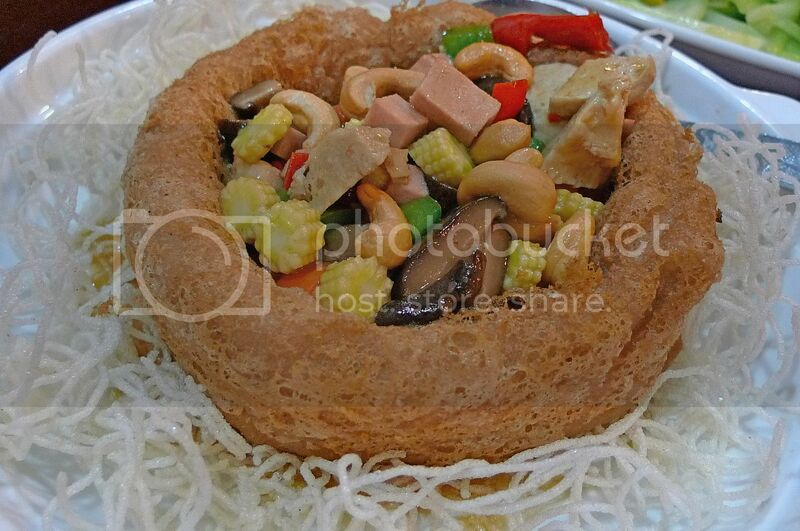 We also ordered the sliced beancurds with mushrooms and vegetables. 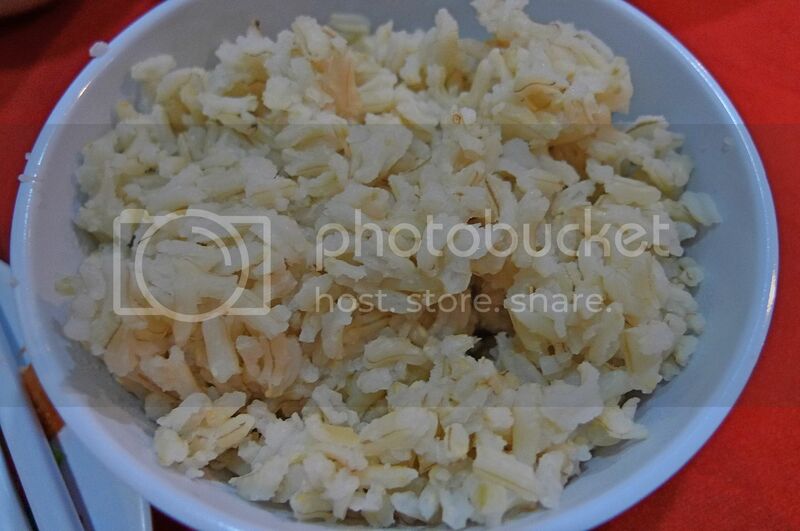 The sauce made this dish very delicious and I even slathered some of the sauce onto my rice for extra flavour! Whenever I go to a vegetarian restaurant, I usually only order pure vegetable dishes and not vegetables masquerading as meat. 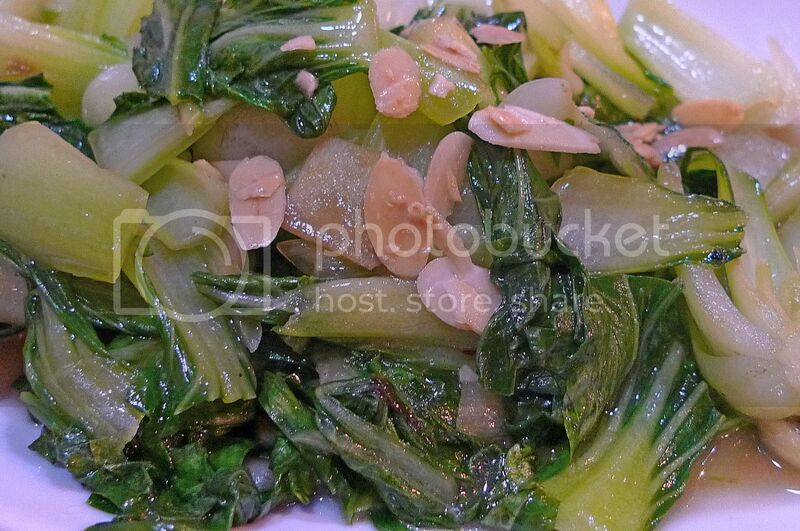 And so for this dinner, we had stir-fried vegetables (lai pak) with ginger and nuts. This was a bit too salty for me, otherwise it was good. All in all, it was a pretty satisfying dinner but with quite an expensive price tag. It costs us about RM180 with the most expensive being the yee sang at RM40. If you are into vegetarian food, this is a good restaurant to go to. I've tried vege resto only once and it was a loooong time ago... after that never tried again cause not so nice la... vege faking as meat just doesn't fancy my taste buds if ya know what I mena? Love the yee sang though and the green vege dish here, yum! I have heard of that tossing the food up brings good luck. Knowing me i would toss it up and it would go all over the floor LOL. Food looks good i want to try that one day. I don't quite like vegetarian food except for the actual vegetables. oh, so this was your reunion dinner or just a normal CNY dinner with your family?? who actually came out with that idea for a vegetarian dinner suddenly?? hahahaha, yeah, like i expected you are somebody who prefer meat than anything else huh?? you are right!! i actually don't like all those "vegetarian meat" at all, i still think vegetarian should be all vegetables..
i once went to a vegetarian dinner with ex-colleagues.. and it's exactly the same like what you have eaten last night..
with all those yee sang, shark's fin, meat and fish.. they really taste like the real one i gotta tell you..
as much as i'm impressed by how close they can make those "vegetarian meat" taste like real ones, i think all are just artificial chemical flavorings..
that's why i think all these "vegetarian meat" are only colorings and flavorings, they are not healthy at all!! 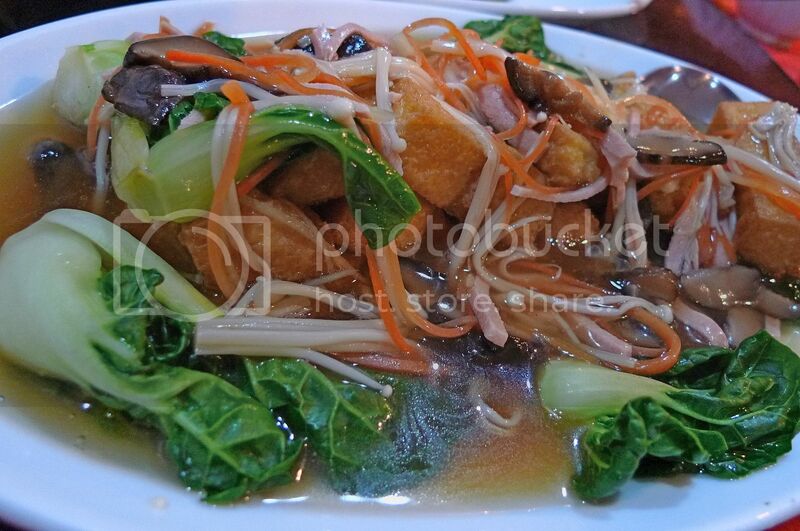 the only vegetarian dishes i like are perhaps the stir fry mix vege, and also the toufu with mushrooms..
and during that dinner, we were trying to order assam fish as one of the dish, and guess what happened?? hahaha, that was really funny.. you gotta choose which type of fish in a vegetarian restaurant!! amazing yeah?? 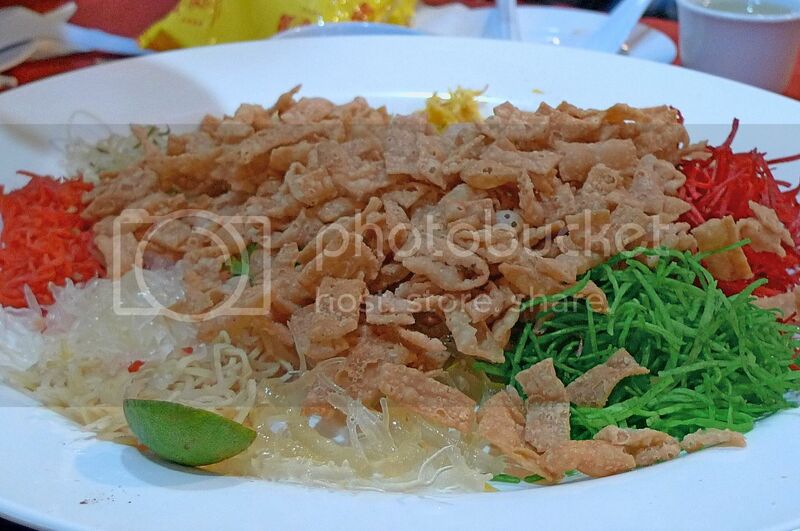 Without the fish practically yee sang itself is already vegetarian right? Love brown rice and the fatt put first thing my chopsticks would go will be cashew nuts..then the yam and the rest last haha..
Nice greens you got there me not too much kangkung legs might get cramps..~;). Me too. I don't like 'fake' meat. 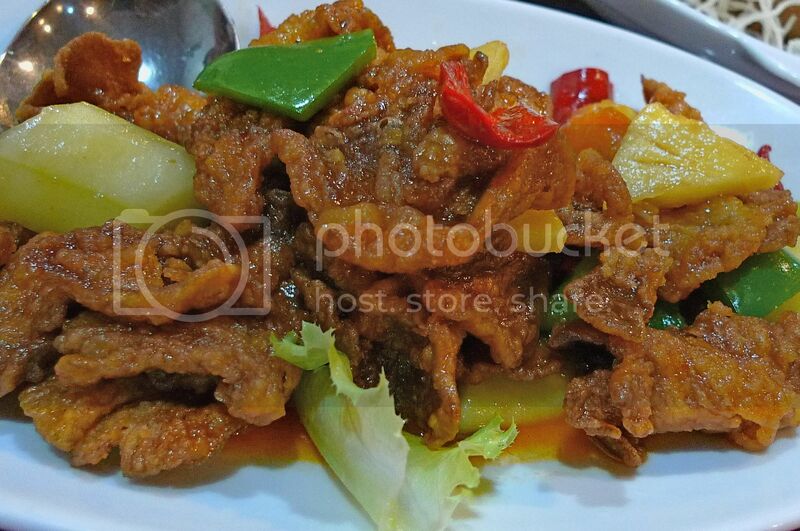 yeah i also don't like to eat vegetarian food that looks like meat - what for?!! Happy CNY! I don't mind having vegetarian meals once in awhile. My Chinese New Year Eve's dinner at Overseas Restaurant wasn't really impressive. Perhaps large crowds had something to do with quality control that night. Those are delicious! I am getting hungry. Yeah. I know what you mean. I also don't like vegetarian foods that pretend as if it was meat. Nice food! Makes me drooling a lot! 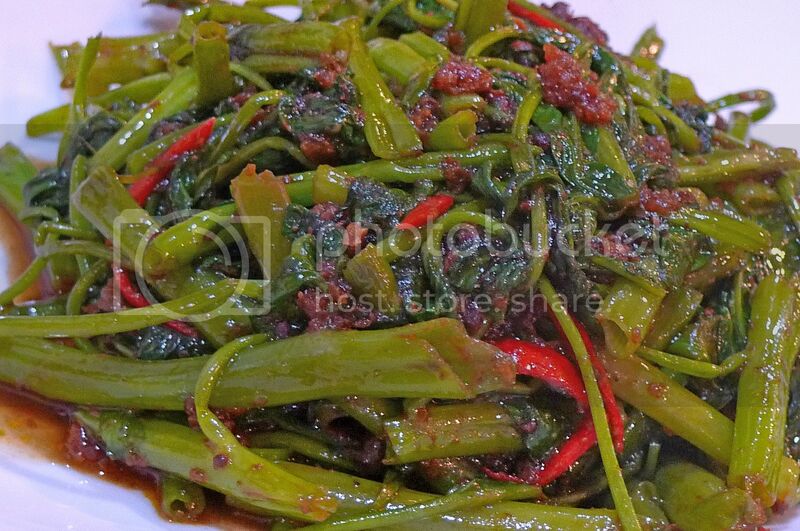 I like the Yee Sang, Sliced beancurds, and Kangkung belacan. i'm not fond of vegetarian food too but i don't mind having it once in a blue moon.